PORTLAND, Ore. (July 25th, 2016) – Measurable marketing agency, Anvil, is delighted to announce that the company has recently been awarded Google Premier Partner status, an honor only three percent of agencies receive. Google created their Badge Partner program in 2011 to connect businesses with advertising agencies that are capable of helping companies grow through AdWords advertising. Badge Partners are advertising agencies that have at least one employee certified in AdWords, manage a minimum of $10,000 in ad spend in a 90-day period, and meet Google’s performance minimums. Google then features these agencies as certified partners and helps refer them to advertisers seeking a PPC expert. 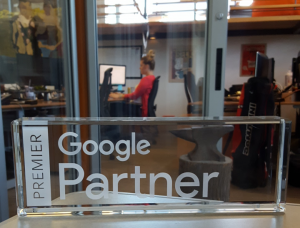 Earlier this month, Google announced its Premier Partner Status, a recognition reserved for Google’s most valued agencies. Less than three percent of Badge Partners were promoted to Premier status. In order to become a Premier Partner, agencies were held to increased ad spend thresholds, higher performance standards, and stringent certification requirements. The Premier Partner status builds on additional awards and recognition for Anvil. CrowdReviews named Anvil a Top 40 Best SEO Companies in 2016. For the second time, The Portland Business Journal named Anvil as a Healthiest Employers of Oregon Awards Honoree this year. Lastly, Anvil received an Excellence in Business Award for the Innovation in Technology from the North/Northeast Business Association (NNEBA). Companies have taken notice of Anvil’s ability to consistently deliver phenomenal results and have trusted Anvil with their marketing budgets. Recent additions to Anvil’s client roster include EarthLink, East West College, eBags, Jani-King, Latus Harley-Davidson, OneWater Marine, Pronghorn Resort, Perfect Company and Tactics Boardshop. Anvil is an award-winning measurable marketing firm with headquarters in Portland, OR that creatively solves business problems for purpose-driven companies. Anvil specializes in providing analytics, search engine optimization, paid media and social media marketing services. Clients include A-Dec, Advantis Credit Union, Cambia Health Solutions, NW Natural, Enjoy Life Foods, Moonstruck Chocolate and Oregon State University. For more information about Anvil, visit www.anvilmediainc.com.